in those cases, minus the ropes. Poet's Notes: My eldest child is just learning to tie his shoes--this after spending the last year or so tying knots in various string like things around the yard and house. "Be careful. That one's a Mattheus knot" is as frequent a warning as "Be careful. That one's a Lucien knot" as little brothers and big brothers carefully follow each other's latest developments. 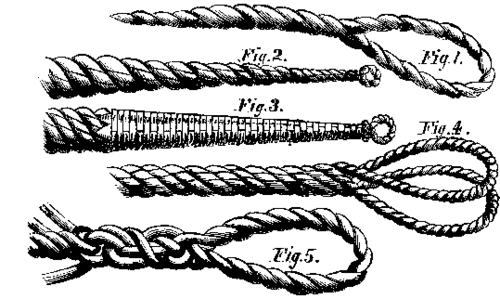 The difficulty in untying such a knot is much more dependent on what was used to make the knot rather than the knot tier's proficiency, though the knots themselves, in practical application, almost always stand the test of whatever needs to be pulled, hoisted, or attached. I keep scissors handy. Shoelaces are another matter. There's a formula, a schematic, a tried and true method passed down through the ages. Editor’s Note: I admit that I read (and liked!) this one simply as a satirical horror piece. I'm glad that I did not grasp the shoe tying metaphor until after I read the poet's notes--that led to a nice surprise!